Brett’s prognostication was correct: Suede is still going strong with this year’s Bloodsports and a slew of highly-anticipated European tour dates this autumn. To coincide with their reunion, the ultimate guide to all things Suede is being rereleased. A newly updated and expanded edition of David Barnett’s definitive Suede tell-all, Love and Poison: The Authorised Biography will hit shelves on May 9th. 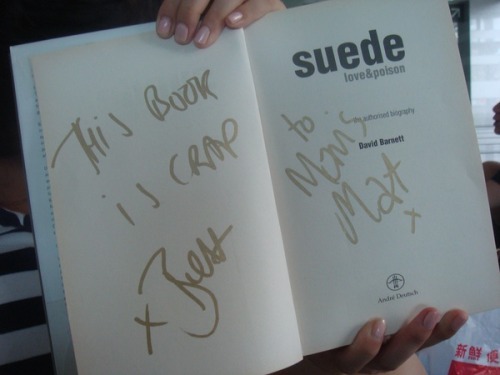 Although this is considered the band’s authoritative chronicle, Brett once inscribed a fan’s copy with a terse ‘This book is crap.’ Surely such protestations would convince anyone to add this book to their collection immediately! The biography is a fan favorite that offers plenty of tantalizing stories for Suedemaniacs. It delves into the early media hype and the eventual disintegration of the relationship between founding members Brett Anderson and Bernard Butler. Of course, there are plenty of dishy stories about the love triangle between Brett, Justine Frischmann, and Damon Albarn. Wild backstage antics, drugs, and their contentious later albums are all explored, as well. The revised edition, which can be pre-ordered at Amazon, will be out next Thursday. Barnett promises expanded text with exclusive behind-the-scenes stories. The update brings us from their 2010 reunion to the present. It’s just another installment in the continuing history of one of the best British bands of the past twenty years.